What a dog biting behaviour? To reduce the risk of aggression, it is important to try not to be afraid or at least not to show. It is true that it is much easier to write it than to do it, but it is possible. I think it’s a question of will and work on oneself, which takes time, but the benefits are substantial. He should try do not yell, do not run, not make big gestures, do not attach the right dog in the eyes. -If your dog is large or if it becomes easily manageable, you will need to regain control of the space; so for these dogs, beds, chairs and other sofas, new or used, regardless of the place where they are located (lounge, veranda, entrance, basement…) are now banned in your presence and cluttered in your absence. -When the dog eats, my advice is very simple: “leave him alone”, while this prevents you from working without food refusal to bait (the professional help is recommended). 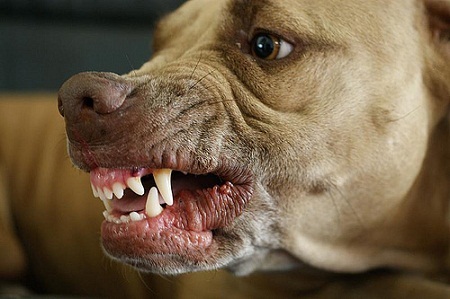 -Possession is an important concept in dogs, most defend what they managed to catch, sometimes up to the bite. Obviously the value of the resource is crucial in the determination of the dog. Some let go like a stick, others severely fight for a simple tennis ball when others still won’t show signs of aggression only for fresh meat or bone marrow! Between them they have not the same values. -Leave a way out is one of the fundamentals to mitigate the risk. A dog or a man who has nothing to lose and more choice more often “sell dearly his fear forgiveness her skin”. I voluntarily left this typo because put a dog is to put it in a worrying situation that he must stop. If he can no longer flee, that him there? -Be able to touch every part of the body of her dog, hold it by the collar are things to teach the dog so that it accepts without reserve in case of need or emergency. If, in the course of a walk, you are threatened by a dog, stay calm and prepare something (bag, sweater, umbrella…) to interpose between you and the dog. Dogs bite almost always the first thing that occurs, it is better that it depiaute your umbrella as your arm. Intervene does not mean threatening: do not shake the umbrella and do not keep it as a stick with which you’d like to hit him because while this may scare some dog, there is no doubt that this will trigger many others. the body of her dog? What to do if my dog bites? How to avoid being bitten by his own dog?